The Super-Tuscan phenomenon grew out of a sense of frustration amongst winegrowers in Tuscany, especially within the Chianti production zone, who wished to make a different kind of wine. They found that the strict rules of the Chianti DOCG prohibited it. They could not make an all-Sangiovese cuvée for example, because they were limited to a maximum of 70% in any blend. And they were forced to include at least 10% of white wine varieties in their red wines, according to the DOCG rules. Their solution was to step outside the DOCG system and make the wines they wished to, knowing the wines would be effectively declassified and could be labelled only as lowly ‘Vino da Tavola’. One can only imagine the consternation in the ranks of the Chianti Classico authorities when some of the region’s most renowned producers led the revolution with wines like the Tignanello, Sassicaia and Ornellaia brands. The movement gathered pace with superb reviews for the wines and prices that soared way above those being achieved by even the most famous Chiantis. The Super-Tuscans were born, and soon the reputation of these renegade wines was the best that Tuscany had to offer. The Super-Tuscans changed the landscape in the region, quite literally in the case of many top wines that moved towards the coast to exploit the maritime influence. Here they grew Bordeaux varieties like Cabernet Sauvignon and Merlot, in a Mediterranean climate, but with conditions that were similar to those enjoyed by the vineyards of the Médoc. The area of Bolgheri, south of the town of Livorno on the Ligurian coast, became one of the hottest spots for this new breed of wine. Wines like Sassicaia and Ornellaia helped convince authorities of the quality of these coastal vineyards to the extent that Bolgheri was eventually awarded DOC status in 1994, bringing the super-Tuscan rebels in from the Vino da Tavola cold. Other changes have taken place to accommodate the super-Tuscans over the years: The various Chianti DOCs relaxed or widened their rules, so that some former Vino da Tavola wines returned to the fold, and the creation of the IGT system (Indicazione Geografica Tipica), a classification similar to France’s Vin de Pays, gave producers another, more noble classification to use on their labels. My colleague David was right when he wrote about the rise – and fall – of the Super-Tuscan phenomenon. There is no doubt that a global infatuation with the wines has cooled in overall terms, and that the various changes to the Tuscan wine scene has closed the schism between these and the more traditional wines, but two examples that landed on my desk recently convinced me that when these wines are good, they are very good indeed. 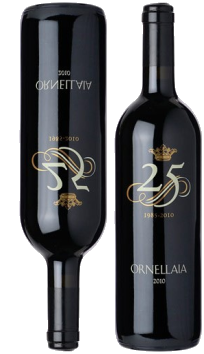 Founded in 1981 but first produced in 1985, Ornellaia is a meticulous selection of Merlot, Cabernet Sauvignon, Cabernet Franc and Petit Verdot grown on the Ornellaia estate. The 2010 tasted here marks their 25th Anniversary, and has been released in a special silkscreened bottle. The estate was founded by Lodovico Antinori, positioned on a hilltop adjacent to Sassicaia, the vineyards sloping down to the coastal plain. Having developed the estate for over a decade, Ornellaia was sold to a joint project between the Marchese de’Frescobaldi and California’s Robert Mondavi, with Mondavi eventually pulling out and Marchesi de’Frescobaldi assuming total control. There are 97 hectares of vineyard, broken down into 27 different plots, identified and categorised according to their specific characteristics. There are two main vineyard areas, one around the winery and another to the north-west of Bolgheri and sited just 5 kilometres from the sea. The Ornellaia estate vines grow on a mix of sand and clay, whilst those to the north are planted in pebbly clay and limestone. These slightly younger vines, exposed to sea breezes, are said to produce slightly lighter wines which complement Ornellaia’s more structured fruit. Though founded in 1998, Caiarossa’s stature has grown since the estate was acquired in 2004 by Dutch businessman Eric Albada Jelgersma, also the owner of Châteaux Giscours and du Tertre in Margaux. Caiarossa is situated in the Val di Cecina, again on the Tuscan coast, and takes its name from its red, gravelly soils. The vineyards are set around the winery on slopes that run towards the Tyrrhenian Sea. Careful geological analysis of the estate’s varied soils has revealed calcareous clay in the lower areas (between 150 to 200 meters above sea level) and large areas of iron-rich sand mixed with stones (mainly found in the higher vineyards). This has led to the definition of twelve specific plots, planted with the most suitable grape varieties from Sangiovese, Merlot, Cabernet Franc, Cabernet Sauvignon, Petit Verdot, Syrah, Grenache, Mourvèdre, with Chardonnay and Viognier planted for the estate’s white wine. The vineyards are planted at high density, and are farmed biodynamically. Caiarossa’s wines bear the IGT Toscana classification, and are aged in a mixture of small barriques, tonneaux and large oak casks. Only a small percentage (35%) of new oak is used for Caiarossa’s top wine. Ornellaia say that the 2010 vintage will be remembered for being a particularly late year: throughout the growing season the vines were 10 days behind normal, as a rainy spring was followed by a hot, dry summer, giving optimal development of the clusters. Still “Painstaking vineyard management, and careful leaf-pulling in particular,” were needed to ensure quality. The 2010 is a blend of 53% Cabernet Sauvignon, 39% Merlot, 4% Cabernet Franc and 4% Petit Verdot. After fermentation in stainless steel the wines was aged for 18 months in barriques, around 70% of which were new. The colour is a saturated dark ruby with a tinge of purple. The nose is all restraint, class and sophistication as a delicate game and cedar emerges, then riper black fruits, but tobacco and smokiness, a certain earthiness, swirl around the blackcurrant giving this contemplative complexity. In the mouth it is hugely refined: there’s a sheen of gloss, of vanilla and coffee, and there is no shortage of sweet, bursting and creamy black fruits, but the tension of the super-slick tannins and fine cherry-skin acidity tug away at the finish. Hints of earthiness, spices and minerality give a real edge of precision and grip as much as the tannins, into a long, very fine and pure finish. A superb wine this, surely with two decades of cellaring potential, its burgeoning richness and structure beautifully balanced. 96/100. £147.10, Hedonism Wines. See all stockists on wine-searcher. 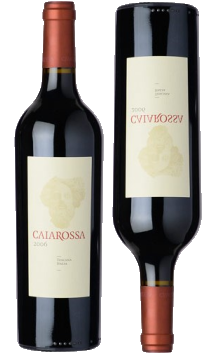 2009 seemed to be a fairly complex year weather-wise for Caiarossa, with a dry early summer, heat and thunderstorms in August and cooler conditions at harvest. Also a Bordeaux-based blend, Caiarossa 2009 is 25% Cabernet Franc, 21% Merlot, 18% Cabernet Sauvignon and 8% Petit Verdot, but there is also 19% Sangiovese and small proportions of Syrah and Alicante Bouschet. Fermentation takes place in large wooden casks and concrete tanks with wild yeasts, then a whole variety of different barrels is used for components of the wine according to its character. It’s a hugely aromatic wine, the Cabernet Franc giving a smoky, herbal-edged, green olive touch and the ripe, creamily blackcurrant weight of the fruit in this 14.5% alcohol wine layered beneath. There is cedar and pepper, and that sappy edge persisting. In the mouth it has wonderful juicy clarity: this is marvellously light on its feet given the alcohol, with a cherry-precision to the acidity and a certain cherry freshness to the fruit, though a deeper, rounder, more opulent fleshiness too. Tannins are refined and finely-textured and the swirl of smoke wreaths through the fruit on the finish. Another absolutely beautiful wine, more showy and less classically restrained than the Ornellaia perhaps, but still with significant ageing potential. 94/100. £42.00, Berry Bros. & Rudd, though by the case the price drops to £35.40 each. See all stockists on wine-searcher.